Not far from the town of Hinche Haiti is an amazing water fall called Bassin Zim. Bassin Zim is one of the hidden treasures of Haiti that has never been explored. Bassin Zim is not just a water fall. The river that becomes this beautiful water called Bassin Zim comes shooting out of a whole in the mountain top, behind a cave. The water then goes through three natural pools before finally creating the water fall. I've been told that behind the water fall is another cave and visitors has swam through the water fall into the cave. Cave in the caribbean is big business. 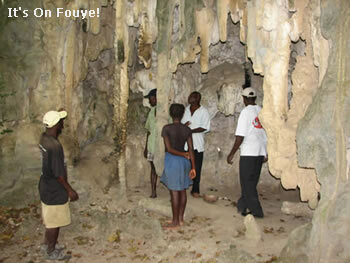 as a haitian i never knew that we have cave. my comment is again we money from the cave, but first we must get expert to test it for safety and design and make it attractive. I remember bieng in Jamaica i went to visit a cave along with some local people we all had to pay to get in there, i believe this new administration haitian government wants to use our natural resources to better the country and the population, but the people need to understand that freeness is over. because all these things we had are not to exploited by foreign nor local but they must used bring income to government funds.